In a cast iron dutch oven or large skillet, pour in vegetable oil to a depth of 2 inches. Heat on high until the oil reaches a temperature of 350 degrees. In a large bowl, toss the wing pieces with the oil and salt. Place pieces in a large plastic bag. Add flour, and shake to coat. Arrange a foil-lined baking sheet. Transfer the flour-coated pieces to the prepared baking sheet. Working in batches, fry the coated wing pieces. Turn frequently to avoid burning. Fry until the internal temperature of the wings reaches 165 degrees F, about 10 minutes. Transfer cooked wings to a large mixing bowl. In a medium saucepan over low heat, combine butter, vinegar, cayenne, garlic powder and hot sauce. Heat until simmering. Stir frequently until the butter is melted and the sauce is fully combined. Remove from heat. Pour the sauce over the wings, and gently toss with a spatula until the wings are completely coated. 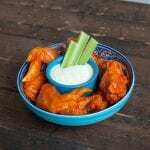 You may prefer to use Frank’s RedHot® Hot Buffalo Wings Sauce rather than make the sauce from scratch.